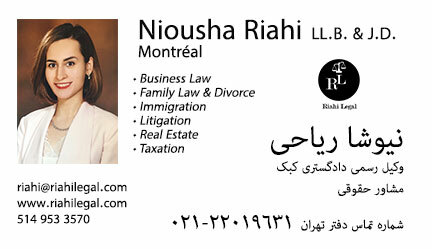 Attorney Niousha Riahi is a certified attorney-at-law in Québec practicing in commercial, civil and family law. She earned a Bachelor of Civil Law and a Juris Doctor (J.D.) from Université de Montréal, where she is currently a candidate for a Master’s degree. Attorney Riahi has acquired a range of experiences as a lawyer in business and tax affairs after working for Justice Canada and a private law firm in Montreal. Her experience includes notably corporate and agreement drafting, negotiations and representation before civil and tax courts. In addition, Attorney Riahi has worked in Washington D.C. as a Canadian law specialist and was also involved in cross-border commercial transactions and negotiations, including distribution, joint venture and licensing agreements. Attorney Riahi is also involved in the community by authoring law articles to promote the integration of the new comers by the way of education to their rights. For this purpose, Attorney Riahi has been a volunteer for Ligue des droits et libertés (section de Québec) and other community organizations devoted to immigrants. Attorney Riahi is currently the vice president of extern communications for the Persian law committee of the University of Montreal’s Graduate Law Student Association (ACSED), Legal panelist for Symposium of Iranian Professionals in Quebec, as well as Lead Project of Notre-Dame-de-Grâce-Westmount Constituency Youth Council for the riding office of Honorable Minister Marc Garneau.